Practically all of life’s molecular processes, from chemical synthesis to replication, involve enzymes that carry out their functions through the catalysis of metastable fuels into waste products. Catalytic control of reaction rates will prove to be as useful and ubiquitous in DNA nanotechnology as it is in biology. Here we present experimental results on the control of the decay rates of a metastable DNA “fuel”. We show that the fuel complex can be induced to decay with a rate about 1600 times faster than it would decay spontaneously. The original DNA hybridization catalyst  achieved a maximal speed-up of roughly 30. The fuel complex discussed here can therefore serve as the basic ingredient for an improved DNA hybridization catalyst. 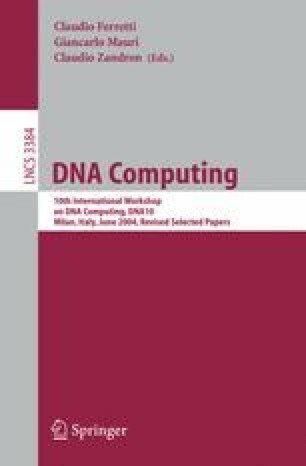 As an example application for DNA hybridization catalysts, we propose a method for implementing arbitrary digital logic circuits.